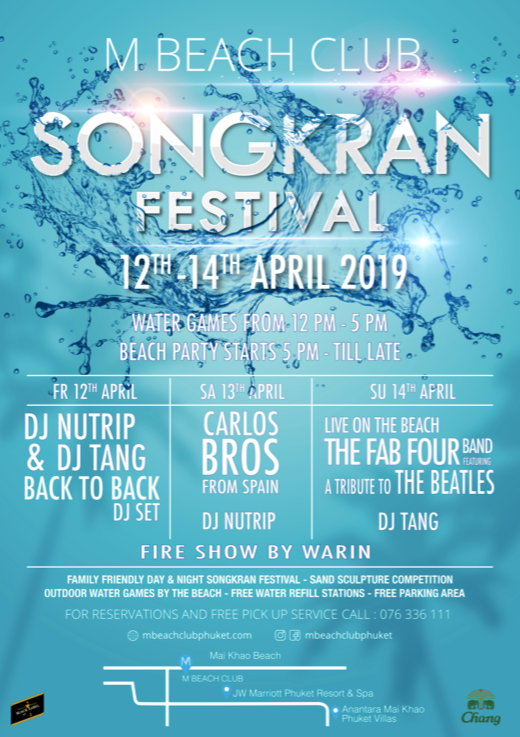 SONGKRAN FESTIVAL// Ring in the Thai New Year with a wet & wild fun celebration by the beach at M Beach Club! Three action-packed days with water games, lots of fun daytime activities, music, and delicious food stations all day. Gear up for our spectacular beach parties starting at 5pm daily and be sure to check out our amazing line up of International and Resident DJ’s including CARLOS BROS from Spain, a tribute to the Beatles on stage by THE FAB FOUR live band and our famous daily fire shows. Bring your family & friends for a Songkran Festival you are never going to forget!